230 x 150 mm. – 69 leaves. With 20 half-page miniatures introducing each chapter. In French and Latin. Manuscript on parchment, illuminated by Guillaume II Le Roy. This deluxe manuscript is testimony to the vivid cultural and artistic life in Lyon, where the Renaissance shone brightly. Its author, the famous humanist Pierre Sala, was a key figure in the transition from medieval to Renaissance culture. This work contains a selection of some twenty lives and famous sayings of Greek philosophers illustrated by a cycle of twenty illuminated half-portraits. 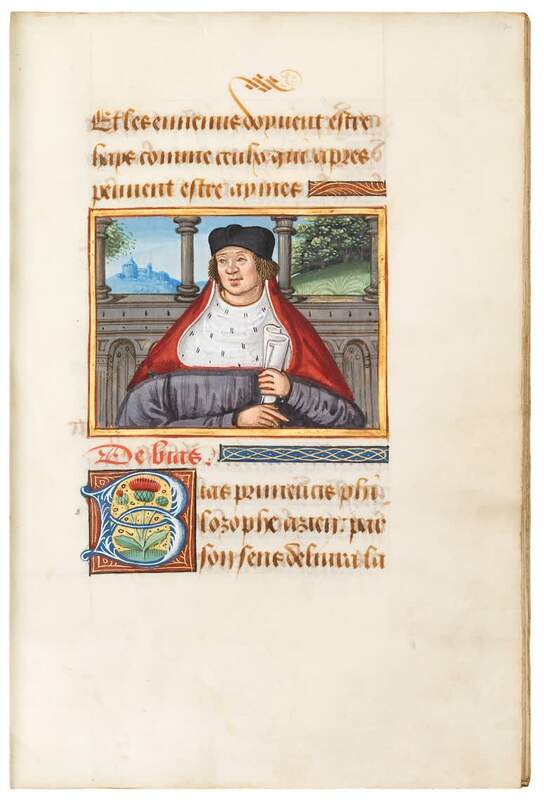 Entirely unrecorded, this manuscript is a pure product of the “seduisant milieu lyonnais” and contains a hitherto unpublished work apparently assembled by Pierre Sala, seigneur d’Anticaille [or Antiquaille] of Lyon, equerry in chief of Charles VIII (before 1457-1529). Stylistic elements confirm a Lyonnaise origin for this manuscript, with miniatures likely by the hand of the Lyonnaise painter and illuminator Guillaume II Le Roy. It must have been commissioned by the author himself, given his close ties with the artist or by someone in his close circle. Sala’s treatise is known in only one other illuminated copy in the Morgan Library. Its illustrious succession of owners adds considerable interest and informs us on the circulation of manuscripts in the age of print, often offered as gifts and tokens of friendship and cultural exchanges. This work is now in the collection of the Bibliothèque municipale in Lyon.